Mr. Stringer was born in Brantley, Alabama where he graduated high school. He joined the United States Army ten months later. 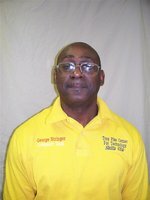 Mr. Stringer has served our country at Red Stone Arsenal, Huntsville, Alabama; Fort Bliss, El Paso, Texas; Korea; Bosnia; and spent over 12 years in Germany. He completed his military career as an Intelligence Security Supervisor with a rank of First Sergeant. Mr. Stringer has been teaching at Troy Pike Center for Technology since his military retirement in 1999. Mr. Stringer is certified in the areas of: Network +, A+ Certification, IC3 Certification, and CAT III Certification. Mr. Stringer has obtained a B.S. in Management from the University of Maryland and an Associate's Degree in Electronics Technology from El Paso Community College. Mr. Stringer is married to Palma Stringer who is also a teacher certified in special education and reading. They have two sons, George Austin and Charles Edward. Mr. Stringers' wife and sons attend his alma mater, Brantley High School.